The nonprofit housing leader is seeking to raise $100 million to support the repair, rebuilding and new construction of homes to assist low- and moderate-income families in Texas, Florida and Puerto Rico. Habitat for Humanity is commencing the long-term phase of its Habitat Hammers Back hurricane recovery initiative, pledging to help more than 6,000 families across regions impacted by hurricanes Harvey, Irma and Maria. The nonprofit housing leader is seeking to raise $100 million to support the repair, rebuilding and new construction of homes to assist low- and moderate-income families in Texas, Florida and Puerto Rico. "We're in the midst of one of the largest housing disasters we have ever experienced in the United States," said Habitat for Humanity International CEO Jonathan Reckford. "Not since Hurricane Katrina devastated the Gulf Coast have we seen so many Americans displaced from their homes and desperate for safe and decent shelter. Just as we were there after Katrina, Sandy, the Haiti earthquake and so many other disasters, Habitat for Humanity will be there for the families hit by Harvey, Irma and Maria." Reckford made the announcement in Houston where Habitat volunteers and partners joined together to repair homes that were heavily damaged by flood waters during Hurricane Harvey. Habitat for Humanity has so far secured $15 million in commitments toward its goal of $100 million to support the rebuilding plan. It is seeking support from corporations, government grants and individual donors to fulfill its commitment. Four organizations—the Dow Chemical Company, General Motors, Thrivent Financial and representatives of America's wind energy companies—made contributions of $1 million or more following hurricanes Harvey and Irma and serve as keystone partners of the Habitat Hammers Back initiative. "We couldn't do this work without the incredibly generous support of our partners like Dow, GM, Thrivent and the American wind energy industry," Reckford said. "We need more supporters to step up and contribute so we can partner with families who most need our help. Please visit habitat.org/hurricanes to learn more and donate." Habitat has set an initial goal to help more than 2,000 families in each of Texas, Florida and Puerto Rico. 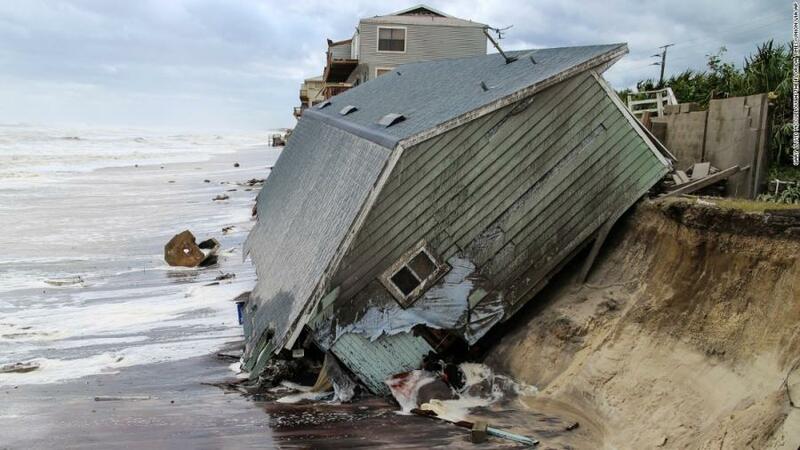 In Texas and Florida, efforts will be focused on home repairs and new construction for storm-affected families over the next three to five years. For Puerto Rico, Habitat is in the process of assembling 2,000 shelter repair kits for distribution on the island as the initial response phase. Habitat will continue assessing the situation in Puerto Rico as conditions allow and determine construction plans following the evaluations. Families that wish to learn more about possible assistance can call 1-800-HABITAT. More information about Habitat's hurricane response work is available at habitat.org/hurricanes.